A solitary, massive, moderately slow growing, monoecious palm with a hapaxanthic or monocarpic mode of growth where the plant dies after setting seed. Not known in cultivation, extinct in the wild. It has a rough, grey-brown trunk, 27.5 m. (90 ft.) tall, 91.5 cm. (36 inch) diameter with no obvious leaf scars, and massive partially segmented, palmate (fan) leaves, 6 m. (20 ft.) long, 6 m. (20 ft.) wide, dark green above and beneath. The leaves are circular costapalmate and carried on 3 m. long stout petioles armed with black teeth. These, together with C. umbraculifera's hold the record of the largest palmate leaves of any plant. The main identification characteristic of C. taliera is that the tree has no persistent leaf-bases when young, unlike other Corypha species which hold huge rhino horn shaped leaf-bases for many years before shedding them to reveal a rough grey trunk. Corypha taliera naturally occurs near streams in valley bottoms, which are often at reasonable altitude. Therefore, one would assume this palm would tolerate some cold conditions. However, valley bottoms are very sheltered and nearby water can artificially raise the air temperature. Close to freezing temperatures can kill this palm. But this palm tolerates a constantly mild climate with little temperature difference between day & night, and Summer & Winter. Under extreme cold conditions we recommend you keep this palm as dry as possible, well wrapped up, and possibly provide additional heat. 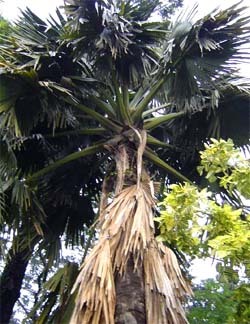 Although the palm in the scrub jungle on the Dhaka University campus is the last known Corypha taliera growing in the wild, the International Union for Conservation of Nature and Natural Resources (IUCN) has already classified the plant on its Red List, as being “extinct in the wild”. This is because molecular work - which is required to confirm the identification - still hasn’t been taken out on the plant. Until molecular work is carried out, they will only say that this plant has been “tentatively identified”. 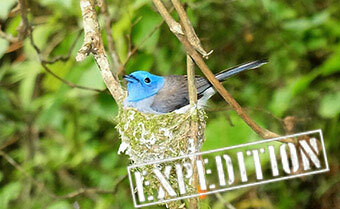 Also, IUCN say that it’s unclear about whether or not the specimen originated from cultivated material. They also mention that the plant is effectively in a “cultivated state”, and therefore probably wouldn’t count towards the “wild” classification. Although not in the wild, Corypha taliera specimens are currently growing in the Indian Botanic Garden and the Fairchild Tropical Garden in Florida, USA. Because these aren’t growing in the natural environment, they don’t count for “wild” plants hence the IUCN classification “Extinct in the Wild”. The palm in the scrub jungle on the Dhaka University campus is now flowering (2009), and will soon die after seeding.